MeshConvert is designed to provide a pipeline approach to mesh generation. To do this, we break up tasks into three different types. Each task is called a module and a chain of modules specifies the pipeline. Output modules write meshes in a variety of formats. Figure 12.2: Illustrative pipeline of the MeshConvert process. Process modules can also have parameters passed to them, that can take arguments, or not. Reads Tecplot polyhedron ascii format converted from Star CCM (.dat). vol: Tag identifying surface to process. Note: Module names change when you use the -p option. Input modules should be preceded by in:, processing modules by proc: and output modules by out:. Input and output modules use file extension names to determine the correct module to use. Not every module is capable of reading high-order information, where it exists. The table below indicates support currently implemented. Only reads nodes, elements and physical groups (which are mapped to composites). Reads elements, fluid boundary conditions. Most curve types are unsupported: high-order information must be defined in an accompanying .hsf file. Reads only the ASCII format.. Reads elements and boundary conditions. In order to read high-order information, run meshpr session.sem > session.msh and place in the same directory as the session file. Star outputs plt file which currently needs to be coverted to ascii using Tecplot. Reads mesh only, only support for quads and triangles (2D) and hexes, prisms, tetrahedra (3D). Reads start ccm format. Reads mesh only, only support for quads and triangles (2D) and hexes, prisms, tetrahedra (3D). Requires NEKTAR_USE_CCM option to be activated in cmake and then requires ccmio library to be compiled by user. Experimental support. Only ASCII triangular data is supported. The resulting file therefore has two composites of IDs 150 and 151 respectively, containing the triangular and quadrilateral elements of the original mesh. Curvature output is highly experimental. Experimental. Only ASCII triangular data is supported. Note that for both Gmsh and VTK, it is highly likely that you will need to experiment with the source code in order to successfully generate meshes since robustness is not guaranteed. In the rest of these subsections, we discuss the various processing modules available within MeshConvert. This option will remove the high order curvature on prismatic faces with singular jacobians. This does not guarantee a non-singular mesh since it is possible for neighbouring element then to have singular jacobians. Multiple calls to the module might help with this scenario. Where high-order information is not available (e.g. 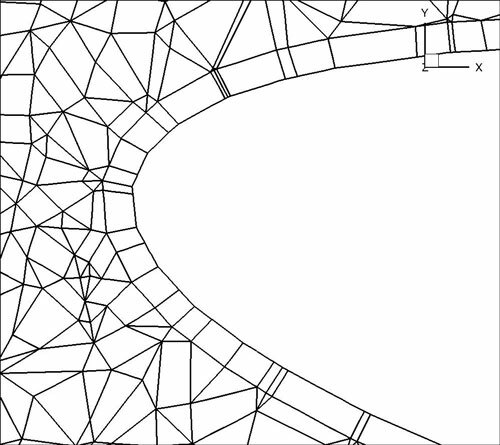 when using meshes from imaging software), various techniques can be used to apply a smoothing to the high-order element. In MeshConvert we use spherigons, a kind of patch used in the computer graphics community used for efficiently smoothing polygon surfaces. Spherigons work through the use of surface normals, where in this sense ‘surface’ refers to the underlying geometry. If we have either the exact or approximate surface normal at each given vertex, spherigon patches approximate the edges connecting two vertices by arcs of a circle. In MeshConvert we can either approximate the surface normals from the linear elements which connect to each vertex (this is done by default), or supply a file which gives the surface normals. If the two surfaces "11" and "12" are not connected, or connect at a sharp edge which is C0 continuous but not C1 smooth, use two separate instances of the spherigon module. This is to avoid the approximated surface normals being incorrect at the edge. When using periodic boundary conditions, the order of the elements within the boundary composite determines which element edges are periodic with the corresponding boundary composite. Here the surfaces with IDs 11 and 12 will be aligned normal to the y-axis and the surfaces 13 and 14 will be aligned normal to the z-axis. Note that this command cannot perform magic – it assumes that any given edge or face lying on the surface is periodic with another face on the opposing surface, that there are the same number of elements on both surfaces, and the corresponding edge or face is the same size and shape but translated along the appropriate axis. Note: One of the present shortcomings of orient is that it throws away all high-order information and works only on the linear element. This can be gotten around if you are just doing e.g. spherigon patches by running this peralign module before the spherigon module. Often it is the case that one can generate a coarse boundary layer grid of a mesh. MeshConvert has a method for splitting prismatic and hexahedral elements into finer elements based on the work presented in  and . You must have a prismatic mesh that is O-type – that is, you can modify the boundary layer without modifying the rest of the mesh. in the standard segment [-1,1]. These are then projected into the coarse elements to construct a sequence of increasingly refined elements, as depicted in figure 12.4. Figure 12.4: Splitting Ωst and applying the mapping χe to obtain a high-order layer of prisms from the macro-element. Figure 12.5: (a) LE with Spherigons but only one prism layer for resolving the boundary layer, (b) LE with Spherigons with 3 growing layers of prisms for better resolving the boundary layer. Note: You can also use an expression in terms of coordinates (x,y,z) for r to make the ratio spatially varying; e.g. r=sin(x). In this case the function should be sufficiently smooth to prevent the elements self-intersecting. 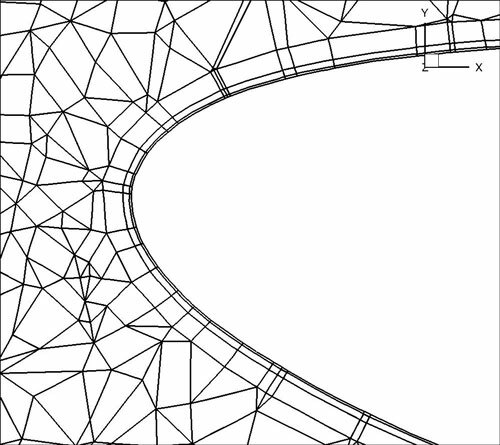 Generating accurate high-order curved geometries in Gmsh is quite challenging. This module processes an existing linear cylindrical mesh, with axis aligned with the z-coordinate axis, to generate accurate high-order curvature information along the edges. surf: Surface on which to apply curvature. This should be the outer surface of the cylinder. r: Radius of the cylinder. N: Number of high-order points along each element edge. Note: The module could also be used to apply curvature along the interior of a hollow cylinder. However, there are no checks to ensure the resulting elements are not self-intersecting. Often one wants to visualise a particular surface of a 3D mesh. MeshConvert supports extraction of two-dimensional surfaces which can be converted using XmlToVtk or similar programs for visualisation purposes, or combined with FieldConvert in order to extract the value of a 3D field on a given surface. where the integers are surface IDs to be extracted. Note: This module makes no attempt to apply the curvature to the interior of the domain. Elements must therefore be coarse in order to prevent self-intersection. If a boundary layer is required, one option is to use this module in combination with the splitting module described earlier.